In today’s unstable economy, you might be in the market for a used car instead of a new one. Ask for routine maintenance records. The owner should be able to provide information about what service work has been done. Buy a vehicle history report. 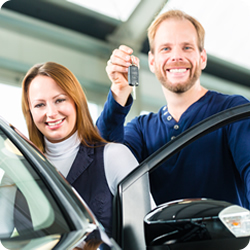 Get the vehicle’s VIN, then go to www.carfax.com or www.autocheck.com and purchase a vehicle history report. The history will show past owners of and damage to the car, as well as mileage and title history. Some state motor vehicle departments may also provide some of this information. Check out the seller. Some unscrupulous sellers may try to sell a poorly repaired salvage vehicle, which means it’s been totaled before and they’ve rebuilt it. If you’re buying from a car dealer, check with the Better Business Bureau. If the seller is an individual, look through the classifieds for other vehicle ads with the same phone number — this is a sign of an unlicensed broker who sells used vehicles by posing as the owner. Ask a professional to inspect the vehicle. Take the vehicle to a mechanic or body shop you trust. Have them inspect the vehicle inside and out for previous repairs and the quality of any repair work they discover. Research insurance costs. Before you buy, ask your local independent agent or broker how much your car will cost to insure. And while you’re there, make sure you have the right coverages for your vehicle. For example, if you’re buying an older or more inexpensive car, you might want to consider dropping Comprehensive and Collision coverages. Following these tips can help you avoid any unwelcome surprises from your new (used) car.